Crown group Alcediniformes include the Alcedinidae (kingfishers) and Meropidae (bee-eaters), which predominantly (Alcedinidae) or exclusively (Meropidae) live in the Old World, and the Todidae (todies) and Momotidae (motmots), whose extant species are restricted to the New World. A clade including these four taxa can be supported by a derived morphology of the columella (Feduccia 1977). 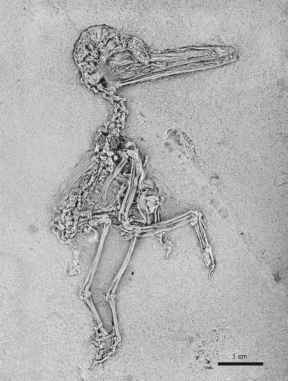 Because alcedini-form birds dig earth tunnels for their nesting sites, they further have a syndactyl foot, in which the three anterior toes are tightly joined over much of their length. Although the Todidae and Momotidae were traditionally assumed to be sister groups and share a derived morphology of the caudal end of the mandible (Olson 1976), molecular analyses support a clade (Todidae + (Momotidae + Alcedinidae)) whose sister taxon are the Meropidae (Ericson et al. 2006; Hackett et al. 2008). of a syndactyl foot. Because of the presumably plesiomorphic morphology of the furcula, it has been hypothesized that Q. longibrachis is the sister taxon of crown group Alcediniformes (Mayr 1998b, 2004d). Protornis glarniensis von Meyer, 1844 from the early Oligocene of Switzerland (Olson 1976) was assigned to the Momotidae by Olson (1976). The species is known from an incomplete skeleton. A second specimen referred to P. glarniensis by Peyer (1957) was identified as a trogon by Olson (1976). Among others, the proximal ends of the mandible of P. glarniensis exhibit marked incisions, which are a derived characteristic of extant Momotidae and Todidae. Except for the proportionally shorter symphysis, the wide and flat mandible of Protornis closely resembles that of the momotid taxa Electron and Hylomanes. Cracraft (1980) pointed out that Olson's (1976) assignment of P. glarniensis to the Momotidae was based on overall similarity and has not yet been established with derived characters. For biogeographic reasons he considered it more likely that Protornis is outside a clade including the Todidae and Momotidae. Whereas the former reservation is valid, the latter is only appropriate if one assumes a sister group relationship between Momotidae and Todidae and a New World stem species of the clade. As noted above, current molecular phylogenies do not support this assumption. Moreover, stem group representatives of the Todidae, whose extant distribution is restricted to the Greater Antilles, also occur in the Paleogene of Europe. 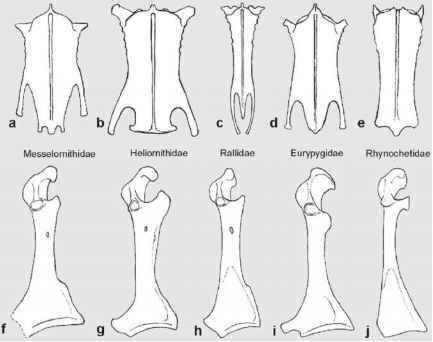 These fossils were assigned to the taxon Palaeotodus, which was originally erected by Olson (1976) for a species from the early Oligocene (Brule Formation) of Wyoming. The description of this North American species, Palaeotodus emryi Olson, 1976, was based on a skull and the proximal portion of a humerus, but there are unde-scribed postcranial remains of a second individual, which also comes from the Brule Formation (Mayr and Knopf 2007b). Because the humerus of P. emryi is proportionally larger than that of extant Todidae, Olson (1976) conjectured that Paleogene todies had better developed wings and dispersal capabilities than their extant relatives. Two species of Palaeotodus, P. escampsiensis and P. itardiensis, were described by Mourer-Chauvire (1985) from the late Eocene (MP 19: P. escampsiensis) and early Oligocene (MP 23: P. itardiensis) of France. The description of P. escamp-siensis is based on an incomplete humerus; of P. itardiensis a proximal ulna, distal tibiotarsus, and proximal tarsometatarsus were found. P. itardiensis is of size similar to that of P. emryi and is distinctly larger than extant todies, whereas P. escamp-siensis is as small as the representatives of crown group Todidae. A species of the Todidae which was identified as Palaeotodus cf. itardiensis also occurs in the early Oligocene of Wiesloch-Frauenweiler (Germany) and is known from a postcranial skeleton (Mayr and Knopf 2007b). This specimen shows that Palaeotodus agrees with extant Momotidae and Todidae in its long hindlimbs (the greatly elongated and slender tarsometatarsus is almost the length of the humerus) and the complete reduction of the procoracoid process of the coracoid. As in crown group Todidae, the carpometacarpus further bears a large intermetacarpal process. The distal end of the tarsometatarsus exhibits, however, a more plesiomorphic morphology than that of modern todies. The extant Old World taxa of the Alcediniformes, i.e., the Meropidae and Alcedinidae, have no published Paleogene fossil record. Although Mourer-Chauvire (1982, 2006) tentatively identified both in the Quercy fissure fillings, the fragmentary remains have not yet been described and need to be substantiated by further material.